You don’t have to replace your entire phone system as you move to unified communications. Cisco VG Series Gateways help you migrate at your own pace and budget by taking full advantage of the investments you have already made. Cisco VG Gateways allow you to enjoy the benefits of unified communications while using your existing analog phones and fax machines. The Cisco VG350 High-Density Analog Voice Gateway enables an IP telephony solution to continue using traditional analog devices while taking advantage of the productivity afforded by IP infrastructure. Standalone solution for high-density for deployments of up to 160 analog ports. The Cisco Unified Communications portfolio of voice and IP communications products and applications enables organizations to communicate more effectively - helping them to streamline business processes, reach the right resource the first time, and improve revenue sales and profitability. The Cisco Unified Communications portfolio is a critical part of the Cisco Business Communications Solution - an integrated solution for organizations of all sizes that also includes network infrastructure, security, and network management products, wireless connectivity, and a lifecycle services approach, along with flexible deployment and outsourced management options, end-user and partner financing packages, and third-party communications applications. The Cisco VG350 offers Cisco IOS Software manageability on analog phone lines to enable them to be used as extensions to the Cisco Unified Communications Manager or Cisco Unified Communications Manager Express system. The Cisco VG350 is offered in a 19-inch rack-mount chassis form. The Cisco VG350, VG224, VG204XM, and VG202XM are part Cisco IOS software-based VG series stand-alone analog voice gateways. The Cisco VG350 is a high-density 160-port gateway, the Cisco VG224 is a 24-port gateway, and the Cisco VG204XM and VG202XM are low-density 4- and 2-port gateways, respectively. 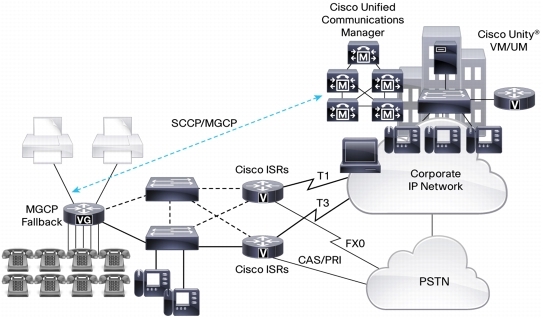 These gateways connect analog phones, fax machines, modems, and speakerphones to an enterprise voice system based on Cisco Unified Communications Manager (Unified CM). Having these devices tightly integrated with the IP-based phone system is advantageous for increased manageability, scalability, and cost-effectiveness (refer to Figure 5 later in this document). Commercial businesses can also use these gateways with Cisco Unified Communications Manager Express to effectively augment an integrated-services-router (ISR) environment. Both topology environments support business needs ranging from high to low concentrations of analog voice ports for modem calls, fax calls, and analog supplementary services. The Cisco VG350, VG224, VG204XM, and VG202XM offer Cisco IOS Software manageability on analog phone lines so that you can use them as extensions to your Cisco or 3rd party IP call control solution. The Cisco VG350 and VG224 offer 19-inch rack-mount chassis, and the Cisco VG204XM and VG202XM offer desktop form-factor chasses with a fanless design. Cisco IOS Software-based hardware: The hardware includes uniform Cisco command-line interface (CLI) and Simple Network Management Protocol Version 3 (SNMPv3) support for ease of gateway configuration and operation. Robust voice quality: Cisco experience in providing toll-quality packet-voice service helps ensure that the Cisco VG350 provides the clear, robust voice quality end users have come to expect from telephony services. Investment protection: Customers can continue to use existing analog phones, fax machines, and modems while taking advantage of IP telephony. Basic analog phone connectivity is needed when the infrastructure (wiring) or application does not support or require IP phones. The Cisco VG350 is the ideal platform to support centralized and highly concentrated analog phone line deployments, allowing organizations to deploy IP telephony without having to purchase IP phones for all users and to continue using existing devices. The Cisco VG350 can also be used in a Cisco Unified Communications Manager Express environment and migrated to Cisco Unified Communications Manager deployment with 100-percent investment protection. High availability: The Cisco VG350 has three Gigabit Ethernet ports to enable link redundancy configurations toward the LAN. Customers will experience less voice downtime due to WAN link failure. The Cisco VG350 has built-in Media Gateway Control Protocol (MGCP) failover to an H.323 connection to a Survivable Remote Site Telephony (SRST) router. This failover will maintain voice service for analog endpoints if the WAN link fails and looses connectivity to the Cisco Unified Communications Manager. Cisco VG350 powered by high-performance multicore processors: In this platform, power redundancy is available by installing an optional integrated Cisco Redundant Power System (RPS), thereby decreasing network downtime and protecting the network from power-supply failures. Reduced barrier to entry: The Cisco VG350 provides a low-cost alternative for low-end analog phones and allows organizations to take advantage of IP telephony with a lower overall IP telephony investment. The Cisco VG350 supports fax machines and modems. When using fax machines, it supports Cisco Fax Relay, T.38 Fax Relay, and fax pass-through. Cisco or T.38 Fax Relay technologies allow transfer of faxes across the network with high reliability using less bandwidth than a voice call. All modems can be connected to the Cisco VG350 and will be transferred over the network using modem pass-through. The Cisco VG350, VG224, VG204XM, and VG202XM are ideal for analog phone deployments ranging from centralized to sparsely concentrated or distributed topologies. These analog voice gateways provide a high level of availability at locations with MGCP fallback, with ease of manageability using Cisco IOS Software monitoring features. They offer many supplementary analog calling features depending on the call control and signaling type used. Refer to Table 1 for the supplementary analog calling features available. The Cisco VG350, VG224, VG204XM, and VG202XM support feature access codes (FACs) in conjunction with Cisco Unified Communications Manager and Cisco Unified Communications Manager Express. Refer to documentation for these applications for details. FXS signaling formats Part numbers SM-D-72FXS and SM-D-48FXS-E support loop-start and ground-start signaling. Homologation requirements vary by country and interface type. For specific country information, refer to the online approvals data base at: http://www.ciscofax.com. The Cisco VG224 platform complies with FCC Part 68, CS-03, European Directive 99/5/EC, and other standards. The Cisco VG202XM and VG204XM platforms comply with FCC Part 68, CS-03, European Directive 99/5/EC, and other standards. Download the Cisco VG Series Gateways Datasheet (PDF).